Money Jihad has long reported on how al-Shabaab profits from Somalia’s charcoal smuggling business, particularly by charging a checkpoint tax authorized by Islamic law. A new report from the United Nations Environmental Programme and Interpol confirms that this activity is ongoing despite a UN ban against Somali charcoal exports, saying that “Al Shabaab retains about one third of the [charcoal] income, which alone constitutes about USD 38–56 million” annually. 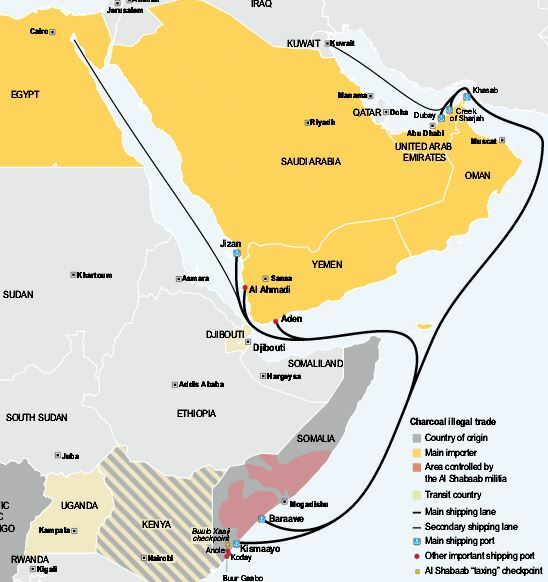 A map in the report shows a key al-Shabaab tax checkpoint at Buulo Xaaji, main points of embarkation from Kismayo and Barawe, major delivery locations at Jizan (Saudi Arabia), Dubai and Sharjah (UAE), and Khasab (Oman), with additional deliveries in Egypt, Yemen, and Kuwait. In addition to “normal” smuggling of charcoal from Somalia to the Gulf states, it is Money Jihad’s belief that rampant trade-based money laundering is occurring between al-Shabaab and these states in which wealthy Arabs are transferring funds to al-Shabaab through over-invoicing for charcoal purchased. In other words, terror financiers in the UAE and Saudi Arabia are intentionally overpaying for Somali charcoal as a means of funding al-Shabaab without simple detection. The Gulf states are doing this to pursue larger strategic interests in Africa.